Perithecia (fruiting bodies) of Cryphonectria cubensis, the cause of eucalyptus canker. Photo by Edward Barnard. Most people, when they think of fungi, will think of mushrooms. 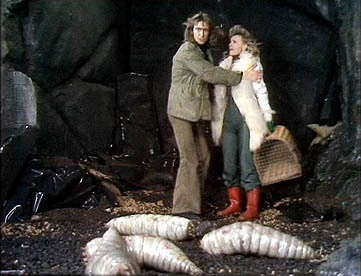 However, the majority of fungi do not produce such large and obvious structures as mushrooms; the majority of fungi are microscopic decomposers, whose minute fruiting bodies would be easily overlooked by those not looking for them. But tiny as these organisms are, they can have a significant effect on your life. The Diaporthales are one order of these microfungi. 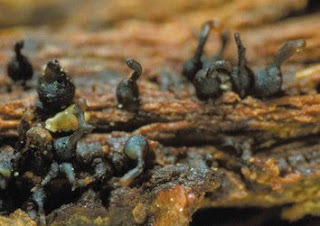 They are a well-defined order of ascomycetes with brown or black perithecia (almost entirely enclosed fruiting bodies with only a single pore at one end and the spores produced inside) submerged either within a stroma (mass of hyphal tissue) or in the surrounding substrate on which they are growing (Rossmann et al., 2007). In many Diaporthales, the opening pore of the perithecia is on a long neck that may or may not also be submerged; it is the combination of round perithecium and elongate neck that lead the authors of one recently-described genus to dub it Lollipopaia (Inderbitzin & Berbee, 2001). Pycnidia of Cryphonectria parasitica protruding from chestnut bark. 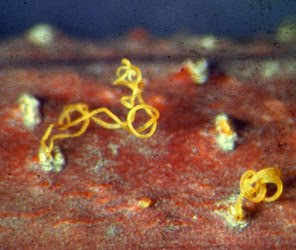 Pycnidia resemble perithecia, but differ in containing asexually- rather than sexually-produced spores. Photo from here. Most Diaporthales are decomposers of rotting wood. As such, they rarely come to humanity's attention, though it probably wouldn't take us long to notice if they disappeared. A small but significant number of Diaporthales, however, have earned a great deal of attention from humans because, while they grow on wood just like their relatives, they don't have the courtesy to wait for the tree to die first. The most famous (or notorious, depending on your preferred choice of adjectives) of Diaporthales is undoubtedly Cryphonectria parasitica, the cause of chestnut blight and famed as the bane of the American chestnut, C. dentata. According to Wikipedia, C. dentata may have made up as much as a quarter of the forest in the Appalachian region of eastern North America prior to the arrival of chestnut blight around 1905; by 1940, it was almost extinct. To this day, the position of the American chestnut across most of its original range remains tenuous; complete extinction has been staved off by the chestnut's ability to produce subsidiary shoots from its base, meaning that a number of trees survive despite being reduced to the central boles. However, complete regrowth is likewise prevented by the fungus attacking any new shoots before they achieve significant growth. Meanwhile, attempts to breed blight-resistant strains of American chestnut are hampered by the tree's slow growth rate. Three views of American chestnut (Castanea dentata). On the left, American chestnut trees as they could still be found in 1910. In the centre, American chestnut as it survives today - an understorey regenerating shrub, prevented from reaching full growth by the inevitable onset of blight. On the right, the intermediary stage in a grown chestnut felled by the fungus. Images from Ellison et al. (2005). When chestnut blight was recorded in European chestnut trees (Castanea sativa) in Italy in 1938, people expected a repeat of the American experience. And at first, that was almost exactly what happened - chestnut blight spread rapidly through western Europe, slowed only by the more scattered distribution of its host (C. sativa was not originally native to most parts of Europe, but introduced by the Romans; as a result, it does not form continuous forests in Europe as C. dentata did in America, but is largely only found where it has been deliberately planted by humans). However, during the 1950s and 1960s, reports started coming in of stands of chestnuts that appeared to be coping surprisingly well despite the obvious presence of blight (Heiniger & Rigling, 1994), with the damage from the blight extending only a short way into the wood (as it does in the Asian chestnut Castanea crenata, the original host of the fungus). What was more, when fungal hyphae from these wimpier infections were transplanted into further chestnut trees amongst more normal raging infections, the more virulent infections began to heal. The reduced virulence turns out to be due to a virus infecting the fungus - the disease being cured by a disease of its own. The spread of reduced virulence among chestnut blight in Europe has massively reduced the European epidemic. Attempts to implement the same cure in North America, however, have mostly resulted in failure (Milgroom & Cortesi, 2004). Transmission of reduced virulence between fungal colonies is slow and ineffecient, and in most cases seems to require direct human intervention to be truly effective. While this direct intervention is feasible with the more scattered European chestnut, it offers little hope of restoring the prior forests of American chestnut. Other species of Diaporthales cause diseases in other crop trees and plants (including butternut canker caused by Sirococcus clavigignenti-juglandacearum, which I'm sure is a terrible thing to be afflicted by, even if it does sound like the name of some sort of confectionary). Dogwood anthracnose is caused by Discula destructiva, recently shown to be an anamorphic (asexual) member of the Diaporthales. Cytospora species attack Eucalyptus, while Greeneria uvicola causes bitter rot in grapes. If you feel enticed to explore the systematics and characteristics of the various subgroups of Diaporthales, there's an impressively detailed coverage on the U.S. Department of Agriculture's Diaporthales page, including a big interactive tree where clicking on a clade brings up descriptions and images to help you while away the hours. Ellison, A. M., M. S. Bank, B. D. Clinton, E. A. Colburn, K. Elliott, C. R. Ford, D. R. Foster, B. D. Kloeppel, J. D. Knoepp, G. M. Lovett, J. Mohan, D. A. Orwig, N. L. Rodenhouse, W. V. Sobczak, K. A. Stinson, J. K. Stone, C. M. Swan, J. Thompson, B. Von Holle & J. R. Webster. 2005. 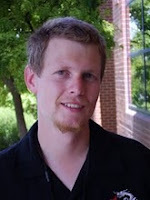 Loss of foundation species: consequences for the structure and dynamics of forested ecosystems. Frontiers in Ecology and the Environment 3 (9): 479-486. Heiniger, U., & D. Rigling. 1994. Biological control of chestnut blight in Europe. Annual Review of Phytopathology 32: 581-599. Inderbitzin, P., & M. L. Berbee. 2001. Lollipopaia minuta from Thailand, a new genus and species of the Diaporthales (Ascomycetes, Fungi) based on morphological and molecular data. Canadian Journal of Botany 79: 1099-1106. Milgroom, M. G., & P. Cortesi. 2004. Biological control of chestnut blight with hypovirulence: a critical analysis. Annual Review of Phytopathology 42: 311-338. Rossmann, A. Y., D. F. Farr & L. A. Castlebury. 2007. A review of the phylogeny and biology of the Diaporthales. Mycoscience 48: 135-144. I’ll take “notorious.” Nice post, thanks for covering such a wonderful, sad North American tree. In addition to the isolated survivor-stands noted on Wikipedia, Bernd Heinrich has written of several he’s found in Western Maine. I visit the area annually, keeping half an eye out for survivors when I hike. So far no luck. The Eastern US is currently suffering from a similarly awful attack, though this one not from a fungus, but an insect. The Woolly Adelgid is decimating Eastern Hemlock forests from Georgia to Maine, and I wonder if my grandkids will hear old-timers talk about Hemlocks the we heard people talk about Chestnuts. You might be interested in reading the Ellison et al. paper I linked to - that discusses the hemlock as well as the chestnut. It also makes the intriguing comment that the eastern hemlock may have only risen to abundance after the loss of the chestnut forests (previously, the allelochemicals produced by the chestnut to exclude other trees from encroaching on its turf may have kept down hemlock numbers). Everything changes, as they say. I followed your suggestion- thanks. Fascinating paper, not only the Chestnut-Hemlock stuff, but also the Whitebark Pine section, a tree closer to home for me nowadays. The references of the paper led me to some of Mattson's other work around the tree and the fascinating links between it, red squirrels and grizzlies.